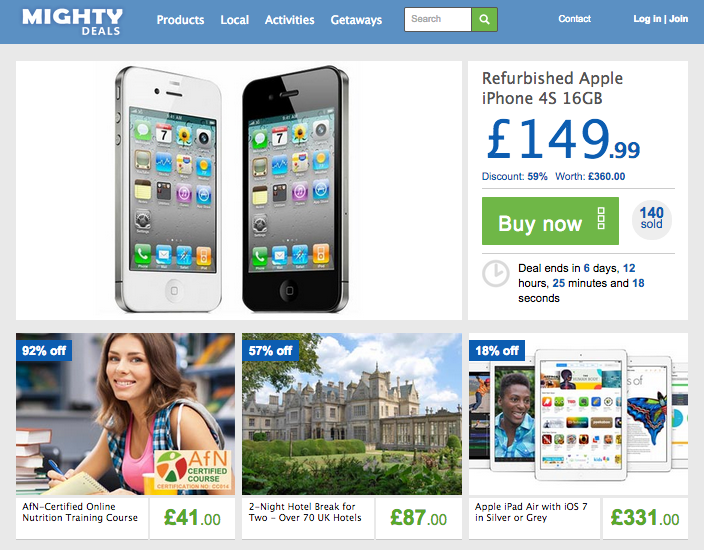 Mightydeals.co.uk gives away thousands of items, activities and getaways at a discounted cost, all across the country. Finding and buying the right deal sends a voucher to your email account, which can then be taken to the merchant and swapped for the given service. With deals on such a wide range of products and activities, and an easy to navigate site, it’s quick and simple to find something that catches your eye. I personally had a bad experience with Mightydeals. I ordered a black iPhone 5 and after almost a month I received a white one. I asked to exchanged it with the correct one or to provide a refund but they refused. I have now started a dispute on Paypal and I am waiting for Mightydeal’s answer. I will update this post as soon as I have an answer from them. Often have 100% off giveaways on Fridays! Mightydeals is a site to go to for those looking for discounted deals, presents and holidays. The range is massive, so it’s unlikely you won’t find something that catches your eye. With few bad points and relatively little against their name, Mightydeals is a solid site for those looking to grab a bargain. Go back to our Home Products or Clothes and Accessories categories to find more websites offering deals and offers.